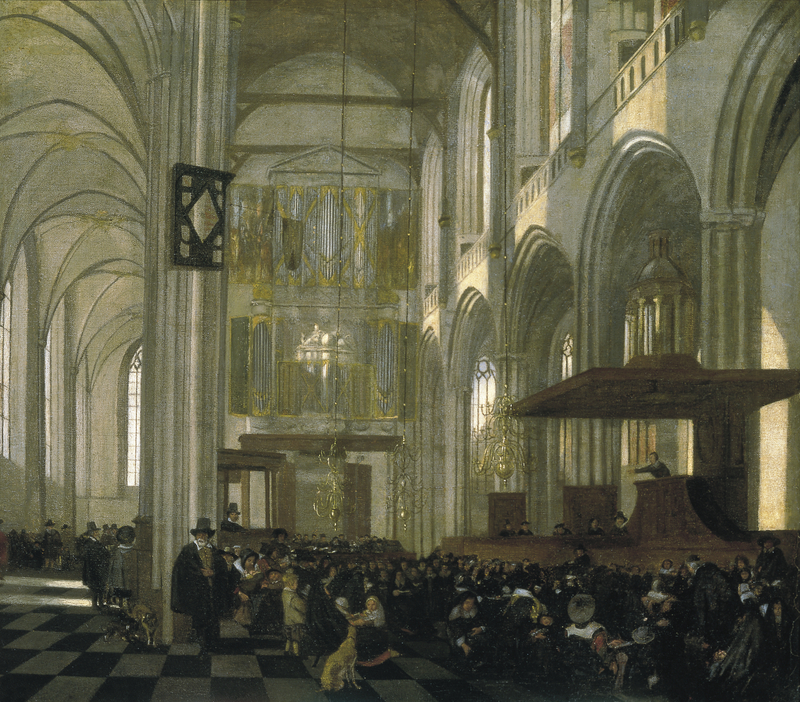 In the deeply shadowed interior of Amsterdam's Nieuwe Kerk, a minister delivers a sermon from the pulpit on the right to a large congregation. The listeners are mostly dressed in sombre black and sit or stand in a ring before the pulpit. They include all ages, the old and very young, as well as their several dogs. Images of religious services, the saying of mass, and the preaching of sermons in church interiors had been depicted earlier by, among other, Pieter Bruegel the Elder (see especially his print Faith (Fides) of 1559) and the architectural painters Hendrick van Steenwijck and Pieter Neefs, but Emanuel de Witte made a speciality of this theme in his art after c. 1650. Crowds of listeners gathered around and harkening to the minister in his pulpit had appeared in his earliest dated church interiors; see, for example, Interior of the Oude Kerk, Delft, During a Service, dated 1651 (London, Wallace Collection). Indeed so completely did De Witte become associated with this theme that his church interior paintings were often described simply as "sermons" in 17th and 18th century inventories. De Witte's first church interiors were painted in Delft where he worked with two other specialists in architecture painting. Gerard Houkgees and Hendrick van Vliet. Together these artists revolutionised the field, which had previously featured mostly images of church interiors with a central vanishing point, an even overall lighting, and rather airless spaces. The Delft painters' approach was more naturalistic in its exploration of angled views, multiple point perspectives, bright contrasts of daylight and shadow, and subtle atmospheric effects. The silvery daylight for which De Witte's Delft period church interiors are admired continued after his move to Amsterdam in 1652, as seen, for example, in his painting dated 1656 (?) in the Boymans-van Beuningen Museum in Rotterdam, inv. no. 1990. The latter work depicts the same subject and interior as the present work, but viewed from the opposite side of the Nieuwe Kerk. However, in the later 1650s De Witte increasingly employed more dramatic contrasts of light and shade, a more tenebrous palette and tonality, and more frontal designs, often with centralised as opposed to angled perspectives. 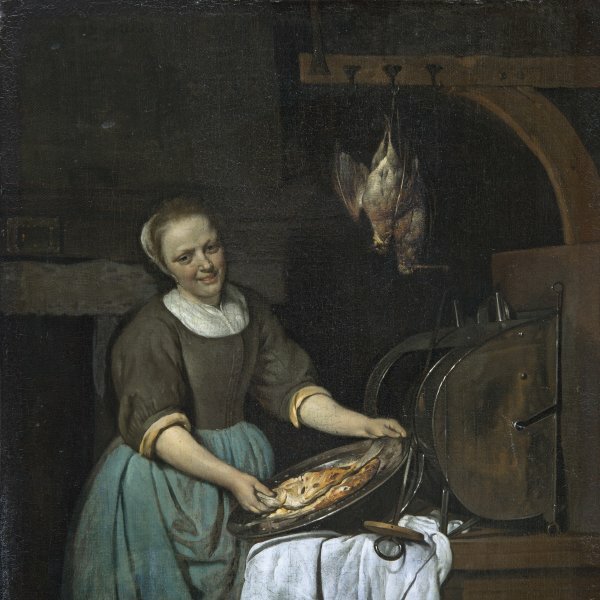 In her 1963 monograph with catalogue raisonné of De Witte's work, Manke plausibly dated the present work to the beginning of the middle period of his Amsterdam years, or c. 1658. De Witte portrayed the Nieuwe Kerk in Amsterdam repeatedly from different points within the church, however not so often as he depicted the Oude Kerk in the same city. He also frequently employed motifs from the Nieuwe Kerk in his imaginary church interiors; two paintings in the Rijksmuseum, Amsterdam (inv. nos. C270 & A474), for example, freely combine details from the Oude and Nieuwe Kerk of Amsterdam. Indeed, few of his "portraits" of either of these structures is without some invented details. De Witte was clearly more attracted to the old Gothic churches of the city than to the newer churches in a more contemporary style, such as the Wester Kerk and Zuider Kerk. Whether this was simply a personal preference or a calculated evocation of the older edifices' associations with tradition and the resonance of history as sites of the foundation of Protestantism in the Netherlands is unclear. De Witte also employs a recurring repertoire of specific figures in his staffage, including the elderly gentleman in the white beard, black cape and hat who here stand off to one side, and the mother seated holding an infant. Some effort has been made to interpret De Witte's figures as specifically symbolic and moralising, however we are probably on surer ground in regarding them as more broadly representative of humankind. By the same token, De Witte's church interiors with services are probably best understood as the distant descendants of the bruegelian tradition of representing Fides.